The real winter has finally arrived in New York City, and temperatures dropped to mid 30s and 40s. We actually skipped our morning walkies a couple of times, because it was below 30 degrees Fahrenheit. All other time we go out bundled up in our winter coats. 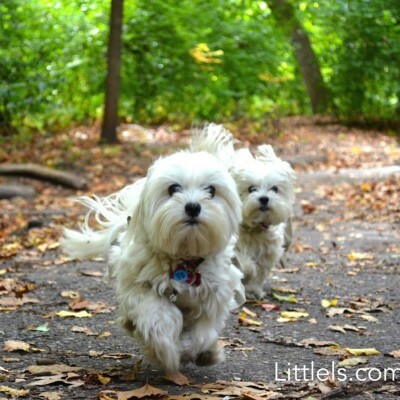 Once in awhile, we see a small doggy walking without a coat or even sweater on, and we just want bark mad at their human. So we decided to write this post to help some clueless humans understand when dogs need to wear coat. Most people assume that because dogs are furry animals, they are somehow immune to the harsh winter weather conditions. Even though most furry animals do just fine during such times, some dogs, just like humans, feel the pinch of the cold weather and may need winter coats to keep warm. The ability of dogs to retain sufficient body heat to keep them warm during winter is dependent on several factors, including the temperature, size and breed of the dog, age, medical conditions, and activity level. 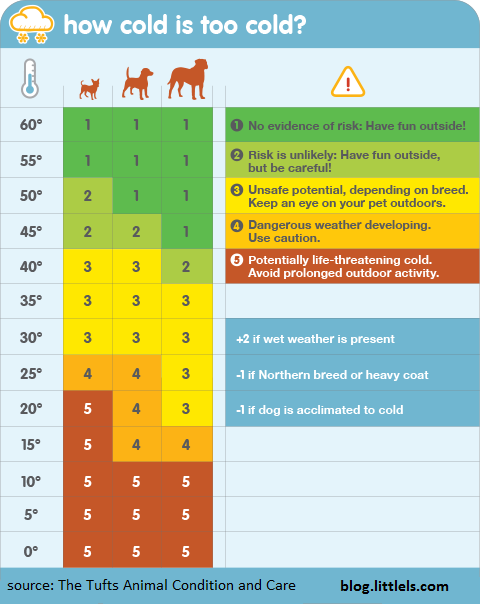 What Temperature is Too Cold for Dogs to Walk? Their lack of double coats means that their ability to retain heat is low and therefore extra insulation is necessary. Note also that even thick fur cannot protect your dog properly if it is matter or wet! Tip: Bringing some healthy all meat dog treats on the walk will also keep your doggy warm and happy! For most dogs senior phase starts around 7 or 8 years (a bit sooner for larger breeds). Older dogs find it more difficult to generate and retain body heat compared to the younger ones. This is because their activity level is slowed and generation of heat becomes cumbersome. You’ll most certainly see aged dogs with their teeth chattering in the winter weather especially when they play outside. Putting a coat over them helps them feel warm and comfortable in such weather conditions. Most puppies have trouble generating and regulating their own body heat due to their small size. While the are growing and adapting to the cold weather in general, make sure they are wearing a coat when walking outside. Have you ever noticed that sometimes when you are unwell and running a fever you still shiver even when it’s hot outside? The same goes for dogs with certain medical conditions. Even though they are furry and may seem well protected from the winter cold, they still need winter coats to keep them warm. Dogs suffering from joint or muscle stiffness, or arthritis require winter coats to help protect their affected body parts from the winter cold. Dogs with skin and fur diseases like Cushing’s disease that affect the growth of hair will definitely need extra insulation in the cold winter weather. Even if your dog does not feel well in general, wearing coat can help their body focus more on fighting with illness and less on staying warm. Please consult with your veterinarian to see if your doggy will require extra layers of clothes during the colder seasons. If you are taking your doggy on a short “poo” break, they might not need a winter coat (although a sweater is still recommended) but spending a lot of time outside would mean that you need protect them from the biting cold. Make sure the coat is comfortable and allows your doggy to move around easily, especially if you are playing fetch, running or otherwise being active during your walks. Engaging overdressed dog in intense activities may actually lead to overheating (typical signs are heavy panting, staggering and increased heartbeat). How To Know If My Dog is Cold? If you see any of these signs, or otherwise suspect that your doggy is cold, immediately take them inside, otherwise you are putting them at risk of getting hypothermia. Coats are also helpful for protecting dogs’ fur and bellies from those dirty city sidewalks. Again because small dogs are closer to the ground, they are more likely to become dirty; that’s why we always wear coats or sweater in the winter and during the rainy seasons. Finally, when choosing a winter coat for your dog, ensure that you choose a material that is easy to clean and one that your doggy will look fashionable in (especially if you live in New York City!) The waterproof or windproof coat is always a great idea, but you can always layer a t-shirt or a light sweater with the fleece coat. Avoid coats with zippers or buttons, and go for the ones with velcros, they are easier to put on/take off. We have several coats in our bins, and we even reviewed some of them on our blog.